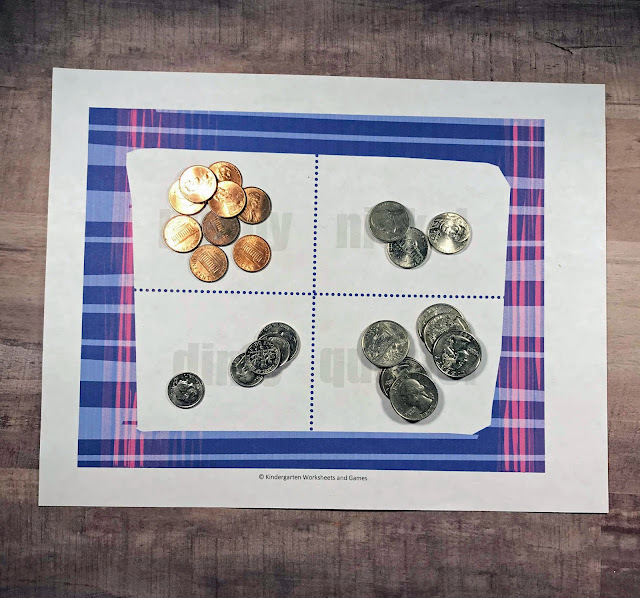 Help kids practice identifying american money and coin sorting with these free printable mats perfect for teaching and practicing identifying money. The first step in knowing how to count coins is for the child to be able to identify which coin is which. Once they are able to identify which is which, knowing their values is important. These sorting mats and activities are perfect for helping with the whole process. 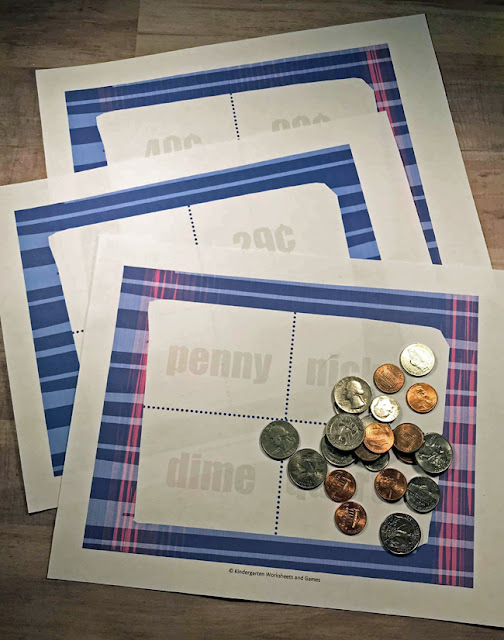 Kids can do these activities over and over and keep practicing coins until they are masters! 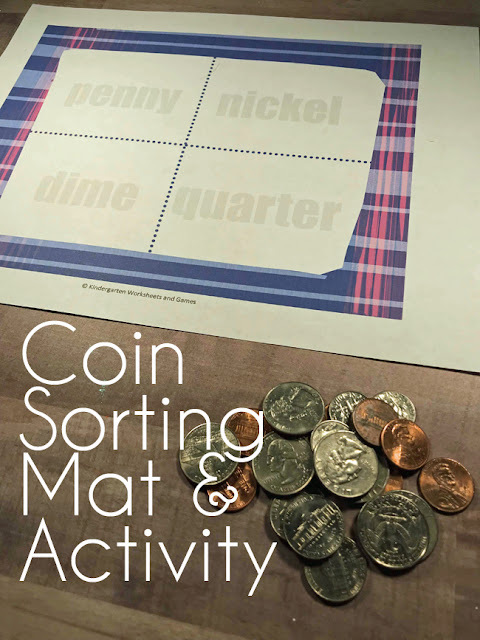 This Coin Sorting Mat and Activity set is perfect for kids who are just learning and exploring coins as well as kids who have been introduced to coins earlier. This set focuses on pennies, nickels, dimes, and quarters. The first step is to print the mats and activity pages. To ensure that these mats can be used over and over, my suggestion is to laminate the pages. This is not required, though. Start by setting out the coin sorting mat. This has four quadrants: penny, nickel, dime, quarter. Give your child a pile of coins and ask them to sort the coins into the correct sections. This can be done with as little or as many coins as you’d wish. The remaining pages are focusing on counting coin practice. Each quadrant has a different price. The denominations are all under $1.00. 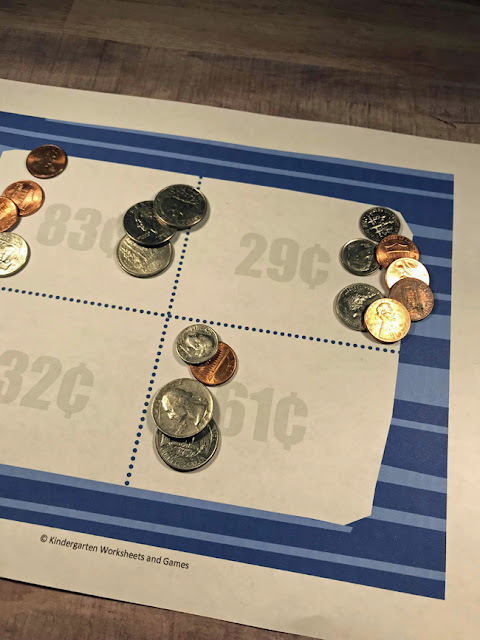 Give the child the same pile of coins and ask them to count the correct number of coins that equal the number in the first square. When this is done, move onto the second square, then the third and finally the fourth. This can be done for all of the pages. There is also a blank page, with just the border and squares. This way you can create your own amounts. Other Ideas You can also ask the child to create as many ways to equal the number in each square. For example, if the number is 38 cents. The child can do 1 quarter, 1 dime and 3 pennies or 1 quarter, 2 nickels and 3 pennies, etc.